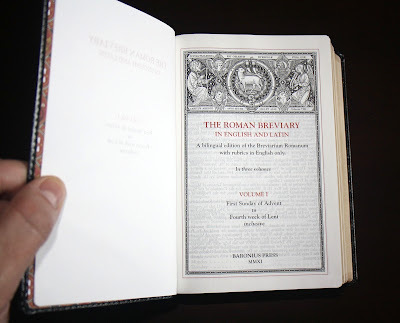 As previously announced, the Baronius Press edition of the Roman Breviary has now been released and I wanted to present a quick review. 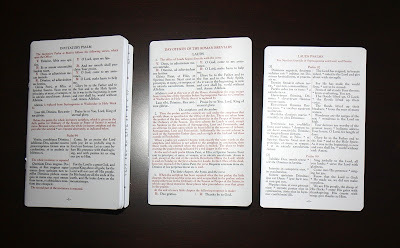 But before I spent to much time on the breviary, let me speak to a couple of other things which come with the breviary. 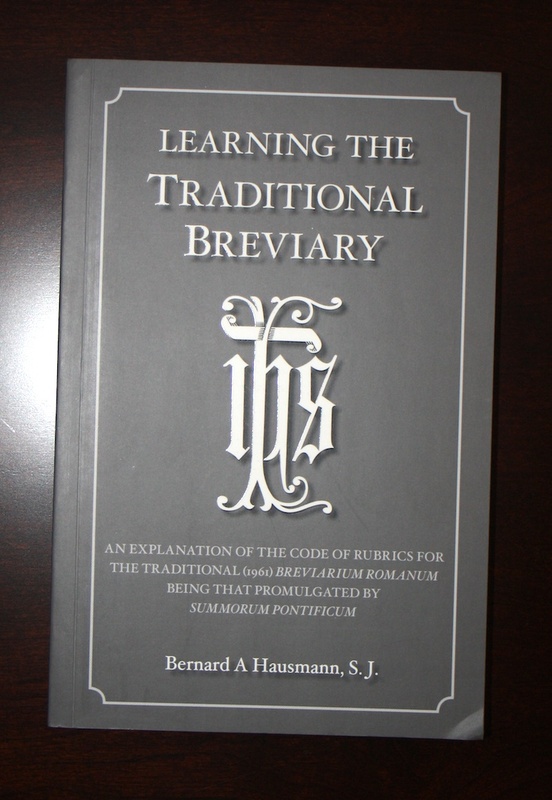 The first is a copy of Learning the Traditional Breviary by Fr. Bernard Hausmann, SJ. This will be a very handy reference, being an explanation of the rubrics for the older Roman Breviary. 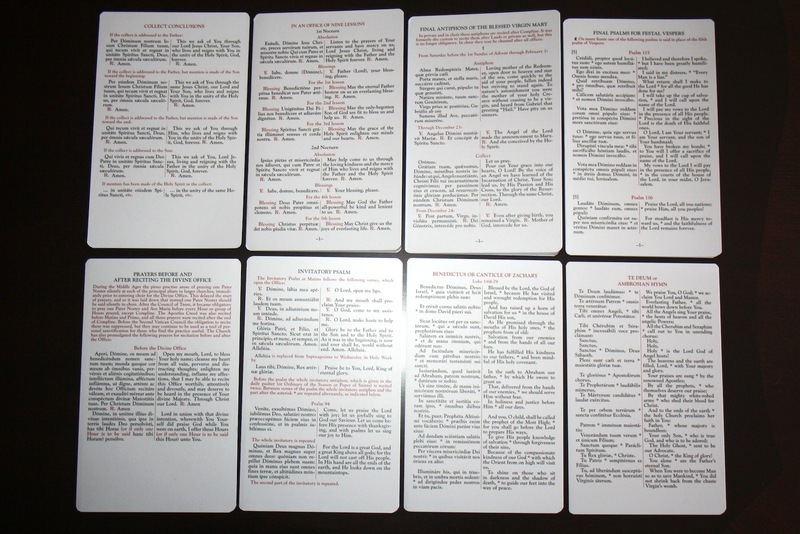 Second, a number of cards have been included with the set for handy quick reference. Most useful will be the cards for the prayers for before and after reciting the Divine Office, the Invitatory Psalm, the Benedictus and Magnificat, the Te Deum, the conclusions for the collects and the final antiphons of the Blessed Virgin Mary for use after Compline. 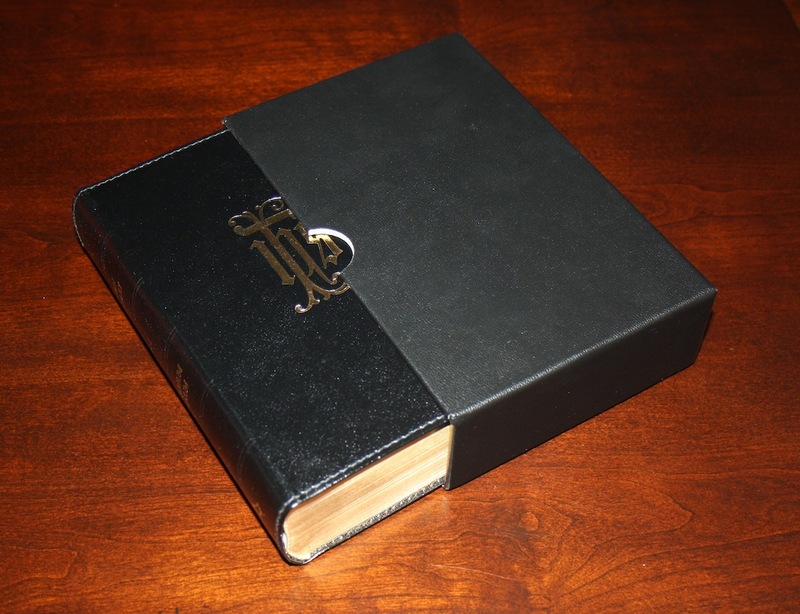 Each volume has its own very sturdy and durable slipcase which will help to protect each volume from dust and other damage. I think this was a very good inclusion. 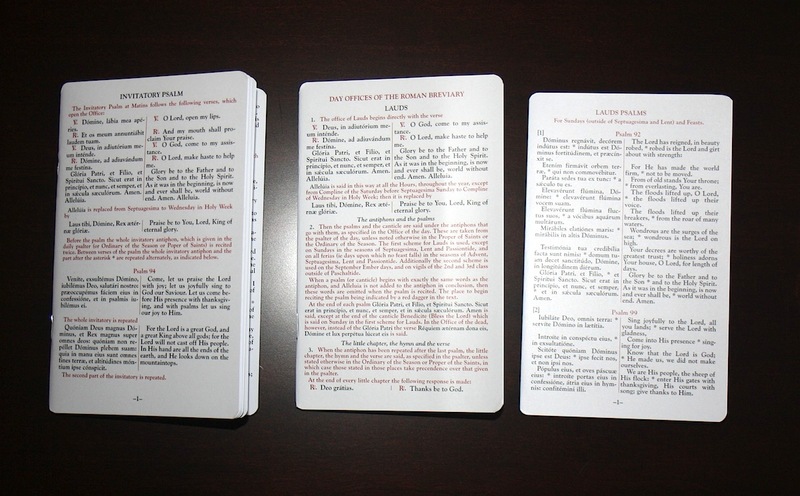 The covers of each volume, which you can see in the above two photographs, are made of flexible leather, just as one would expect for a breviary. Each cover has a gold tooled IHS monogram on the front cover in gothic script. 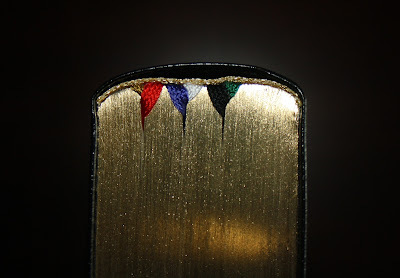 The spines carry decorative tooling that denote the "ribbing" that would traditionally be found in book construction. While this is purely decorative, and while it might have been nice to have seen this raised, it is nonetheless attractive and adds a bit more visual interest to the spines. The spines have gold titling on each of them, with the Latin and English titling on each. 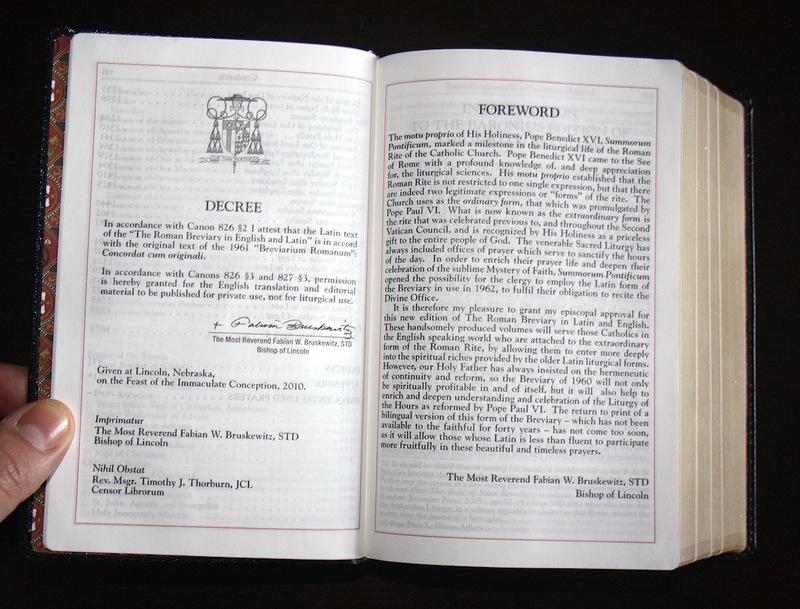 As this is not a four volume set, the volumes are simply denoted as being the 1st, 2nd or 3rd volume. 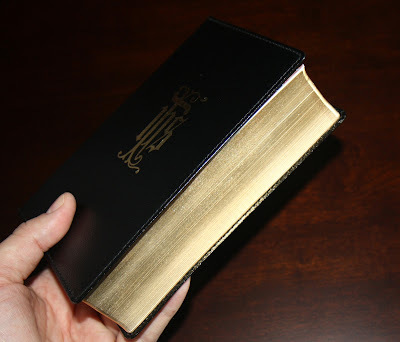 The pages of the volume themselves are gold git and rounded. From what I can tell, the gilding looks to be a very good quality (better than shows up in our photo here). 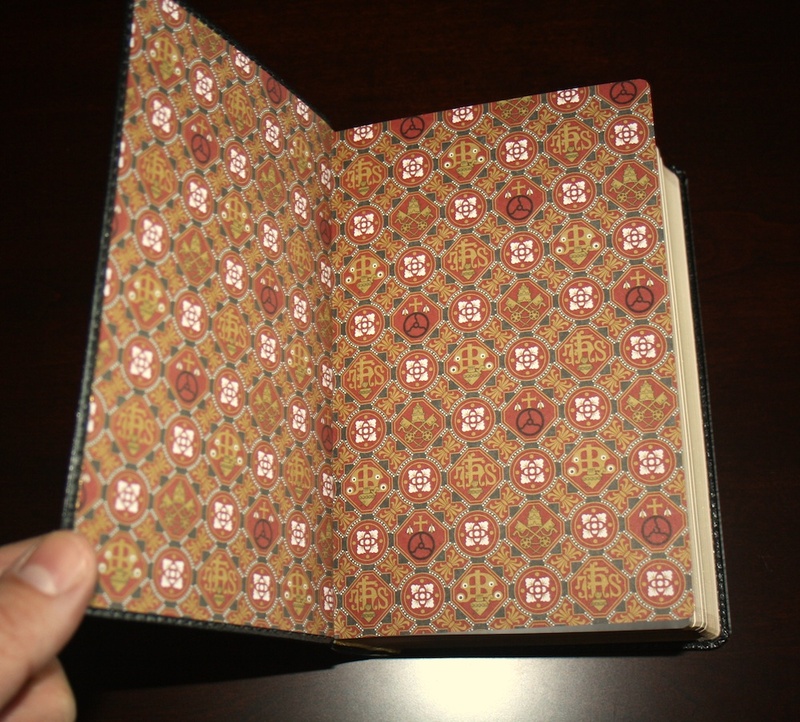 As we turn inward, we will find beautiful endpapers on each of the volumes. This was an inclusion that I was pleasantly surprised by when I first opened up the breviary, and I am very glad to see this sort of attention to detail. 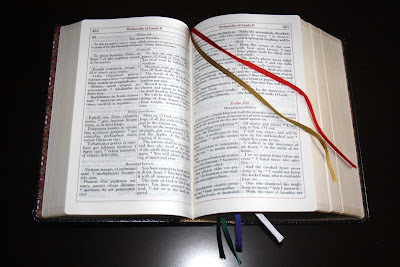 There are six ribbons per volume, which is the right number in my view, and they are coloured in the liturgical colours -- a point I commented upon in my recent review of the new English editions of the Roman Missal. Those ribbons are sewn and look to be quite durable. 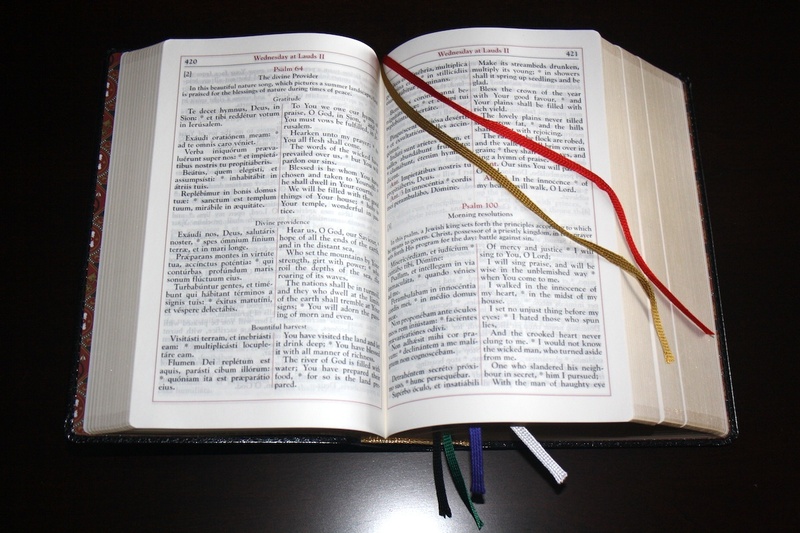 Turning now inward to the pages of the breviary itself, first a quick word or two about those pages. As a first point of note, the paper used is a traditional onion skin, or bible paper. As well, I want to note that the type of the breviary is very crisp and two coloured: red and black. Each of the pages also includes an attractive red border around the text and between the Latin and English columns which gives an overall very traditional and finished appearance. 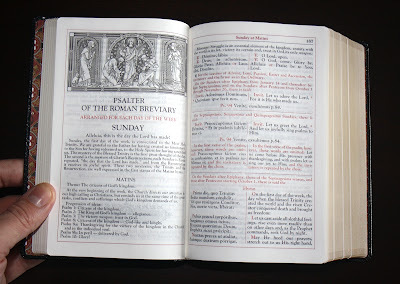 I was very pleased to see Pius Parsch's excellent "Introduction to the Hours of the Breviary" included within the introductory pages; a text which we have referenced here on NLM before. I would be remiss to not at least note that also to be found is an introduction by the Baronius editor in chief, and also the Latin and English text of the motu proprio Summorum Pontificum. 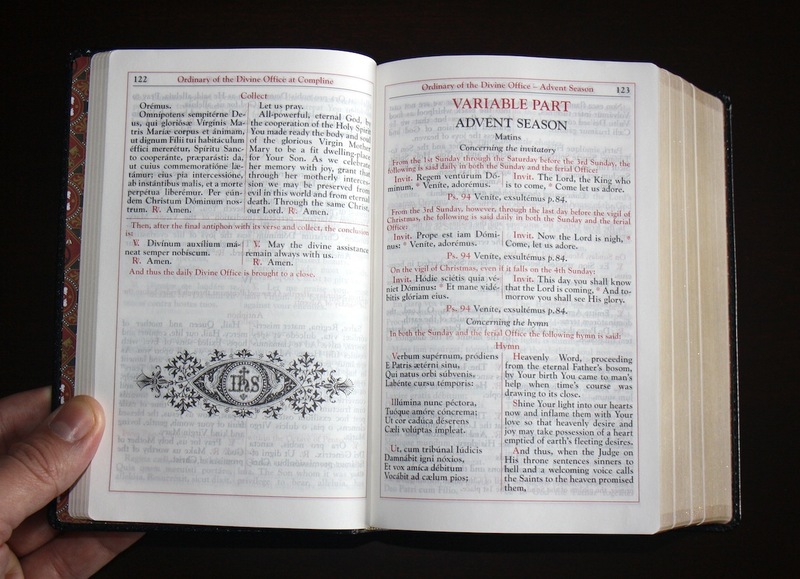 All that said of the introductory pages, let us now turn to the real meat of the breviary. I have already noted the fine onion skin paper that is used, the excellent and clear red and black typography (any possible blurriness is not from the text itself, but rather in the photograph be assured), but what I haven't mentioned is the art included. Throughout the 3 volumes, thirty traditional engravings as found in older liturgical books have been included. These have been scanned and re-mastered. They come out very well and you will see some of them in the pages below. 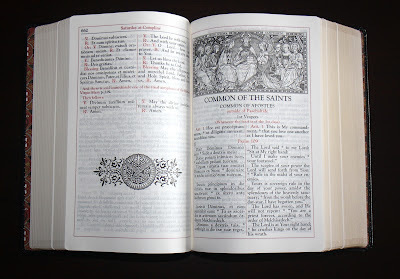 While the Baronius Breviary essentially follows that of the Collegeville Breviary of 1963, certain changes and additions have been made to the text for this edition. Most notably the Pius XII Psalter has been replaced with the Gallican Psalter of St. Jerome. The English versions of the psalms and canticles have been thoroughly revised in order to make them correspond to the Latin of the Vulgate. 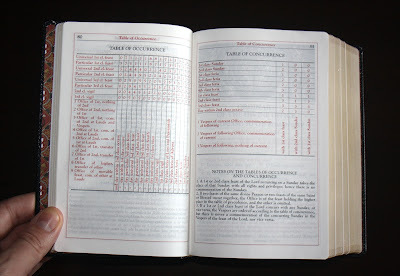 Where it was thought necessary the English text of other parts of the Hours has also been revised in order to make them more closely conform to the Latin original. 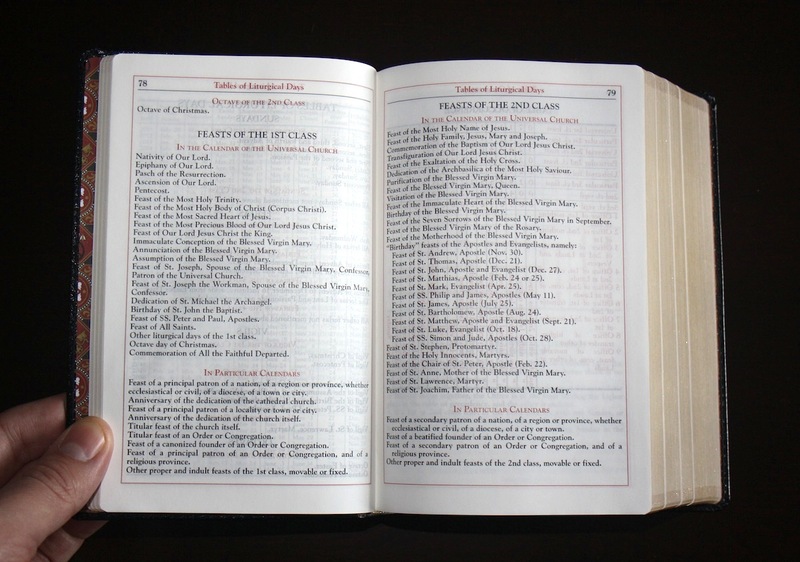 Additionally, it should be noted that the English translation of the hymns found within this breviary are from The Hymns of the Roman Liturgy by Fr. Joseph Connelly -- more on this in the summary of thoughts immediately below -- and the English translations of the scriptures are based off of the Confraternity of Christian Doctrine version. 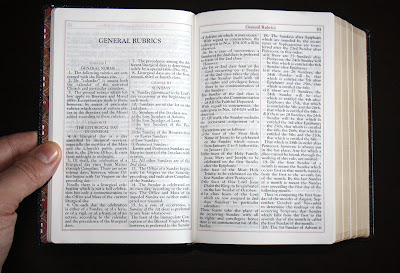 Psalter commentaries are also included, which, like the introduction, are taken from Pius Parsch. So all of that presented, what might our conclusions be? 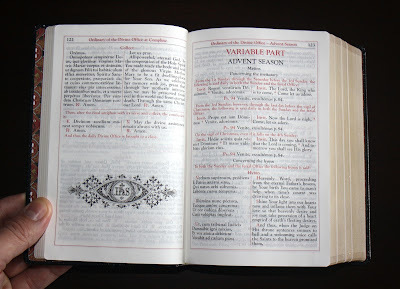 Speaking for myself, from what I have seen of this edition of the breviary so far, I believe it was well worth the wait. 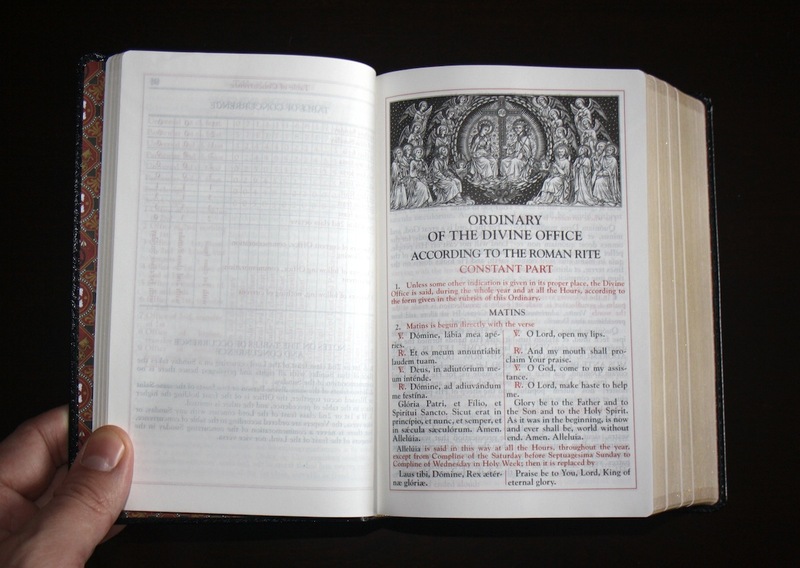 It is a beautiful, well produced edition of the Divine Office which employs qualitative materials in its construction -- which is exactly as it should be. Moreover, I think the pricing is entirely reasonable given both the aforementioned considerations and given that I suspect this set will last for a great many years to come. Before the day is finished, Creator of the world, we earnestly ask of You that, in keeping with Your mercy, You be our protector and defence. As you can see, the difference here is found in Neale's use of rhyme and verse. 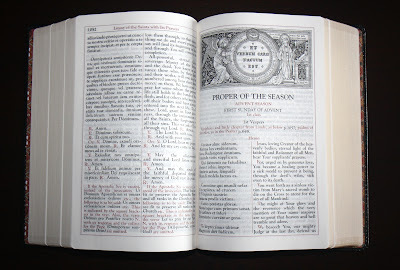 Admittedly, translations of such Latin hymns are a tricky business wherein one must weigh between accuracy and literalism versus rhyme and verse -- the latter of which often results in compromises in the translation it goes without saying. So then, what I make note of, let me be clear, I make note of simply as a matter of personal preference: I personally prefer something more akin to what Neale produced than Connelly; others would take a different view. 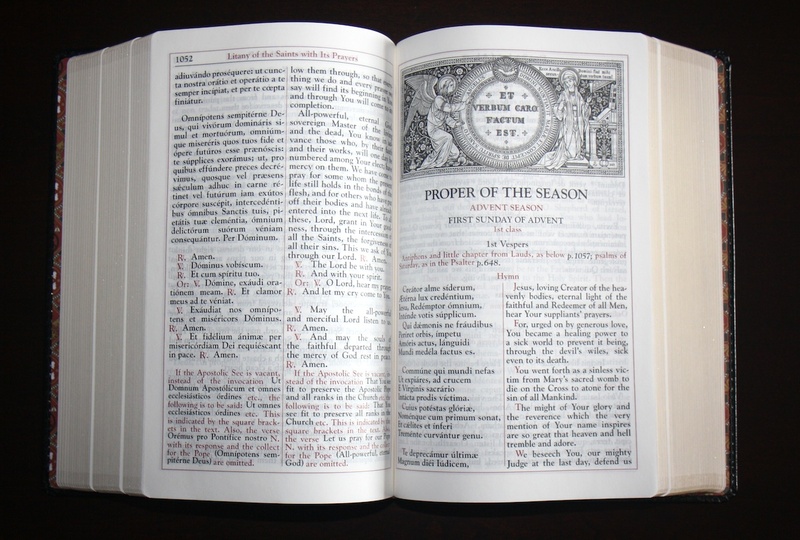 Regardless of your position on this particular point however, in the overall scale of things it certainly wouldn't stop me from using this edition of the breviary -- and having read through some of the psalm translations and translations of the collects, I am overall quite content indeed. All said then, this edition of the Divine Office is certainly a worthwhile investment, worthy of your Christmas list or for saving up your "book budget" over next while to acquire. I certainly have no hesitations in giving it my recommendation.